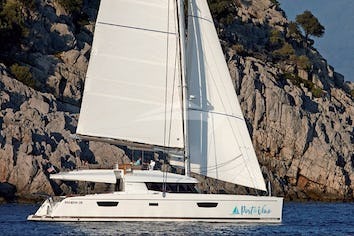 SLIM is the last of her series, a Gunboat 66 designed by Morrelli & Melvin as a fast cruising catamaran. 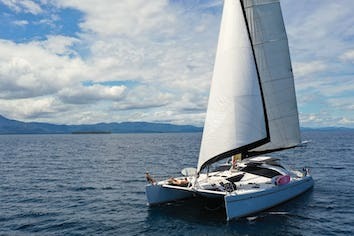 She is custom fitted to her owner's requirements for cruising the globe and exploring far places from the unique platform of a sailboat. 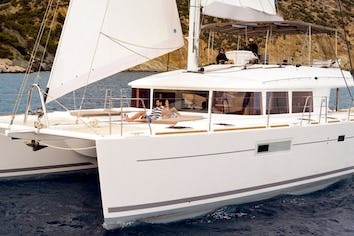 With a composite carbon fiber construction and a fast displacement racing hull design, she handles any conditions and delivers superior sailing performance with elegant lines, comfort and an extravagant design. She comfortably sleeps 6 people in three cabins, all equipped with an en-suite bath, walk-in shower, sound system and a flat screen TV. MORE DETAILS: Port hull is as follows: Aft cabin with double bed. Midships cabin with double bed. Forward cabin with over/under bunkbeds. All port side cabins share a midships head/shower and a separate shower just forward of the aft cabin.The owner set the port side up with just his kids in mind…he was only begun chartering a few years after owning Slim hence she’s more suited to a family than 3 couples, or 2couples as that way one couple gets the privacy of the entire port side and the other couple gets the Owner’s cabin which is full privacy. Originally from Durban, South Africa, Travis has a rich and formidable understanding of the ocean and is a specialised Gunboat captain. His enthusiasm for sailing across oceans is equalled only by his love for swimming, cycling, and running. He enters Iron man triathlons whenever SLIM's itinerary allows. Ana, born in Cordeba, Argentina, has a fantastic combination of warm hospitality and fiery wit. Her South American spirit of adventure and fun-loving attitude radiate as she explores new horizons. 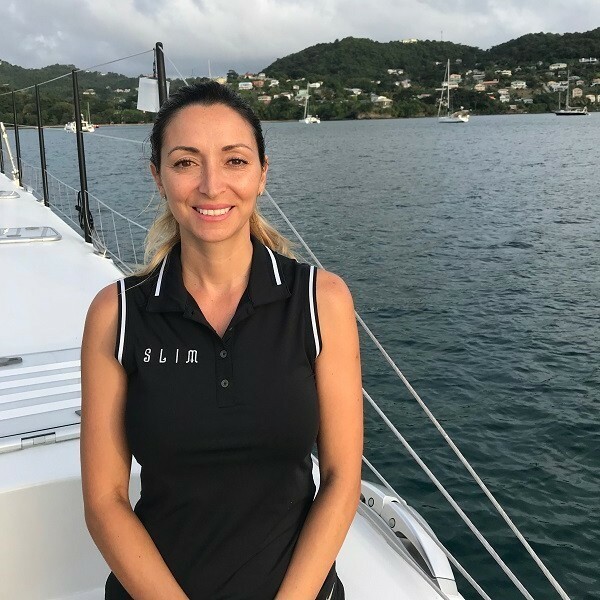 She has a deep love for the ocean and her sailing experience runs just as deep. Ana's has a passion and a refined sensibility for healthy tasting cuisine influenced by the many cultures she's been exposed to while travelling around the world. *menu is subject to change depending on location, availability of provisions and sailing conditions. "The crew was fantastic and I would highly recommend them to anyone who is looking. I know they only do 1-2 a year- but I would reach out for any groups in the future as they might do it and I know that they would have a wonderful time." Please note that Ana and Travis are among the best crew I have ever had the pleasure to sail with! They are wonderful people, super willing and kind, and most importantly fun to be around. It was a great vacation and a real treat!